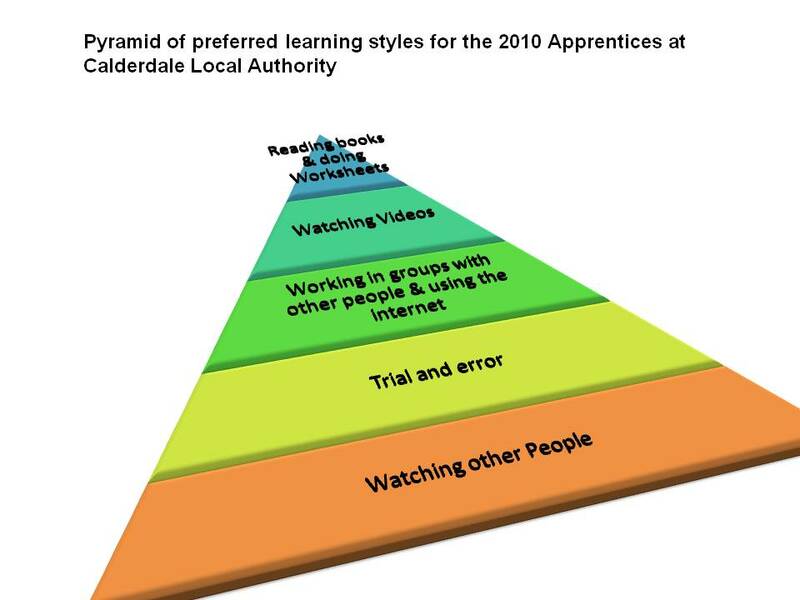 Figure 1: An initial assessment of Literacy ability was carried out at the start of the learners programme, end of November 2009. The levels ranged from Entry 3 to level 2, with no learners in the group showing ability to level 3 standards. 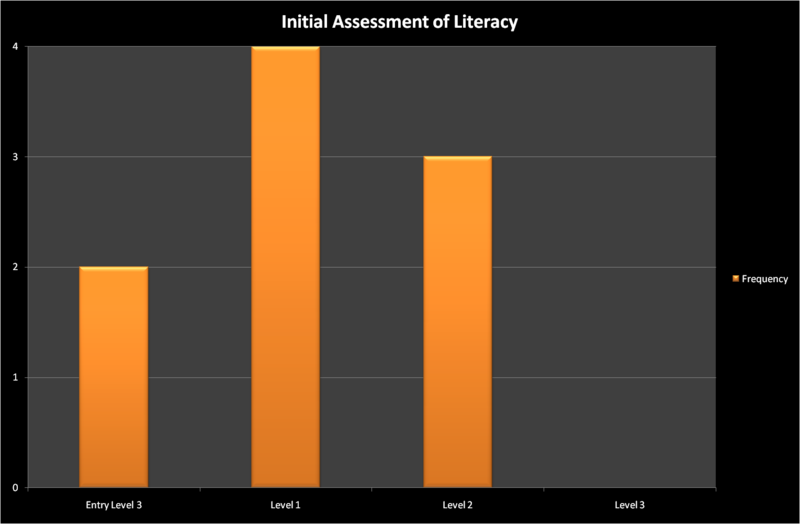 The bar chart above shows that most of this cohort is grouped in the Entry 3 to level 1 standard. The learners have to pass level 1 Key Skills in Communication as part of their Apprenticeship framework and additional support may be needed for a fifth of the cohort. A SFL tutor will be put in place to support the vocational tutor with the Literacy aspect of the groups learning. Figure 2. 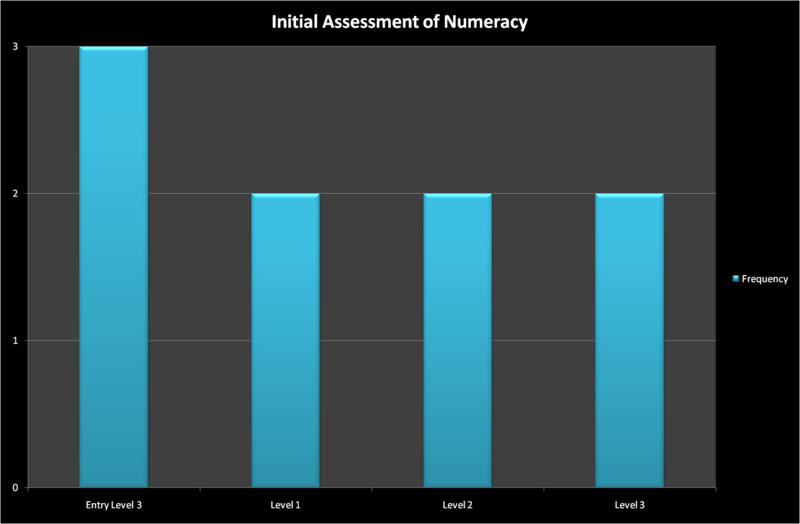 An initial assessment of Numeracy ability was carried out at the start of the learners programme, end of November 2009. The levels are far ranging from Entry level 3 to level 3. It shows that a fifth of the cohort to be high achievers in Numeracy, however almost two-fifths are at Entry Level 3. This diverse range in ability can provide a challenging task for the tutor to keep everyone engaged and with this cohort, the SFL tutor and Assessor will promote peer engagement using the strengths of some learners to work with the others to reach successful outcomes. This can only happen if the group dynamics are good which provides the opportunity to work in a holistic way. Figures 3 & 4. The distribution of the answers to the Learner questionnaire received at the start of the project in November 2009 indicate a response that can be summerised as a prioritised triangle of responses (Figure 4). 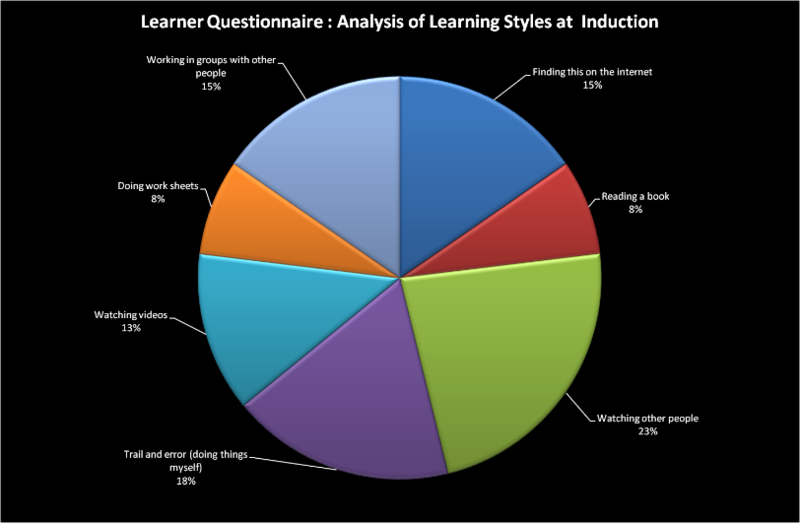 From the small group of learners the aggregated preferred learning style indicates as Watching other people. Secondly to a practical aspect of trial and error or learning by experience. Interestingly, the working in groups, using the internet and the watching videos are grouped together, and not split by the learning style of reading and doing worksheets. Does this suggest that the learners on the project prefer to 'learn by experience', by 'peer review', and by 'using technology' as oppose to what may be seen as intrinsic methods of training delivery i.e. reading workbooks? The template questionnaire is available on the Project Research page. Figure 5. The answers to the questionnaire were received in November 2009. The mean value to the importance of each question was received in the mid-range (4 to 7). This has shown for this group of learners that there were no substantial differences in the learners views, with most responses within the mid-range. 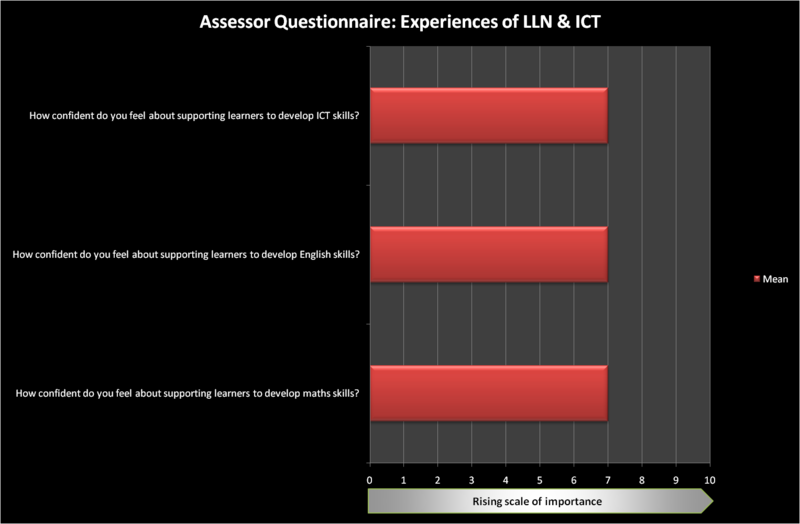 The confidence in using ICT is relatively high, as well as the importance and use of English (literacy and language) in the workplace. The project is structured on the delivery of a contextualised Mathematical problem, with the hypothesis of improving confidence and ability in Maths. This survey indicates low confidence and moderately low regard for Maths in the workplace and hopefully the experiential project will improve these perceptions. Figure 6. The Assessor and Mentor for the project were questioned at the start of the project in November 2009, regarding their experiences and confidence levels. The survey results suggest that the confidence levels, were at an appropriate level to proceed with the project with this Assessor and Mentor.